According to a recent post on Google Operating System blog, the giant search engine will show automatic translation for some words people search in a foreign language. It means that you no longer need to type “translate” along with the word when you search for the English translation, but it only works for words and some expressions. For longer texts, you’ll still need to type “translate” in the search box to receive the translation. 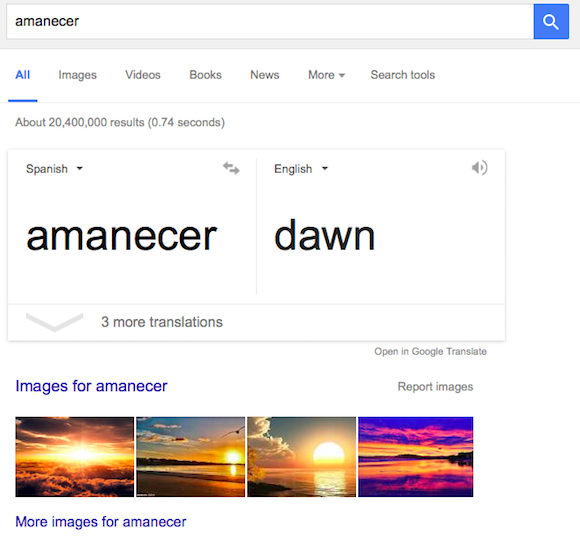 For instance, it works for “buenas noches” to get automatic translation, but you’ll have to add “translate” in the search bar, if you are looking for “buenas noches señora”. No word on whether Google will expand this new feature to longer texts or will be limited to some expressions and words. Google Translate service now supports over 100 languages and will continue to grow.